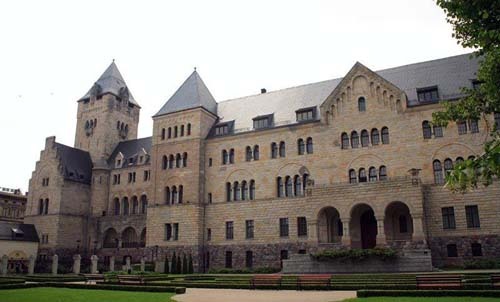 The constructon of this castle began in 1905 and was completed in 1910. After the capitulation of Poland in 1939, it was decided to transform the castle into Adolf Hitler's residence. It was also used by the Gauleiter of Reichsgau Wartheland, Arthur Greiser. The castle was reconstructed during the German occupation by Albert Speer. The chapel was changed into the private cabinet of Hitler (an exact copy of Hitler's room in the Reich Chanceller), the throne room was transformed into an audience hall and a bunker (with room for 375 people) was built under the castle. The construction was haltered in 1943, due to the setbacks on the Eastern Front. During the Battle of Posen in 1945, the castle was used as temporary POW camp for German soldiers. The Imperial Castle of Poznań can be visited. The archictural elements of the German Third Reich can still be found on many places.